If semiosis defines the process of signification in language or literature, and signification constitutes the representation or conveyance of meaning, then the Semiosis Quartet fearlessly, efficaciously, and fully signified at the New School in Cambridge on Friday. “New music” falls short of describing Friday evening’s concert in the living room of the old house on Lowell Street less than crammed with avid listeners. A sudden loud banging at the door and a male voice yelling obscenities, however, was not part of the quartet’s plans. The opener Missy Mazzoli’s Death Valley Junction reflected on a postmodern subjectivism, which Semiosis barely vivified. In-the-moment glissandos yowled with motorized bowing, both denying any real sense of expectancy. This could have been the composer’s intention, but Semiosis’s overplaying may also have played a part. Semiosis came near to reproducing the piece’s simple chord structure of triads continually being reshaped as if they were rubber bands. Semiosis seemed in warm-up mode as did Mazzoli’s writing. Eric Nathan’s Omaggio a Gesualdo posed perilous sonorities reminiscent of the Italian’s madrigal Moro, Lasso (I die, alas) and that’s when the unforeseen disturbance occurred. Everybody was wondering what was going on. We were informed that a man threw a fit when he was not allowed to enter the room while the performance was going on. Next came honking from the parking lot with Semiosis members running to the windows. They caught the license plate number. Eventually, it was decided not to call the police. Better to continue on with the concert. Stranger still, the would-be intruder was stopped by the Cambridge police just down the street! Remarkably poised and in good humor, Semiosis took to the highly crafted textural play of Eric Nathan. After arresting sonorities came announced superfluities that developed, and finally climaxed. Gesualdo signifiers—his harmonic language—came toward the end. The young quartet played out spiffily. Fantasia on the Theme of Plum Blossoms from Shih-Hui Chen reminded of earlier string quartet writing of European descent, at times engaging in flirtations with slow motion, that popular device from the “international style.” Pentatonic signs appeared amidst phrases that frequently worked loose in more chromatically conceived modes. Simulators of the plucked Chinese instrument, the pipa, found their way to the viola. Try as they did, and it certainly appeared that Semiosis had this piece down pat, little plum or blossom could be seen. Aaron Jay Myers introduced his composition, drawing up the bizarre and the cultish more as motivation than as substantive fodder. Revisiting an array of once new compositional zones might have been Myers’s method of choice for his meaning of “I’ll Swallow Your Soul.” Conscious shifts from one device to another, from struggle to ennui, from nonfigurative to movie soundtrack, informed the lengthy survey. And again, the recently founded young Semiosis Quartet sparked, roared, and lyricized, doing its level best to transfuse the stream-of-conscious cultishness with lifeblood. “Black is the Color of My True Love’s Hair” is the out-and-out signifier with which Steven Snowden began his Appalachian Polaroids. A recording of a timeless traditional folk melody sung in back country dialect failed again after “take two.” With the recording now working, Americana signed and stamped itself all over Snowden’s short excursion. Finely attuned to his picturesqueness, Semiosis droned, shifted into railroad chugging rhythm, and glorified the melodic duets haunted by the folk song. Polaroids cadenced with a touching nostalgic glance. 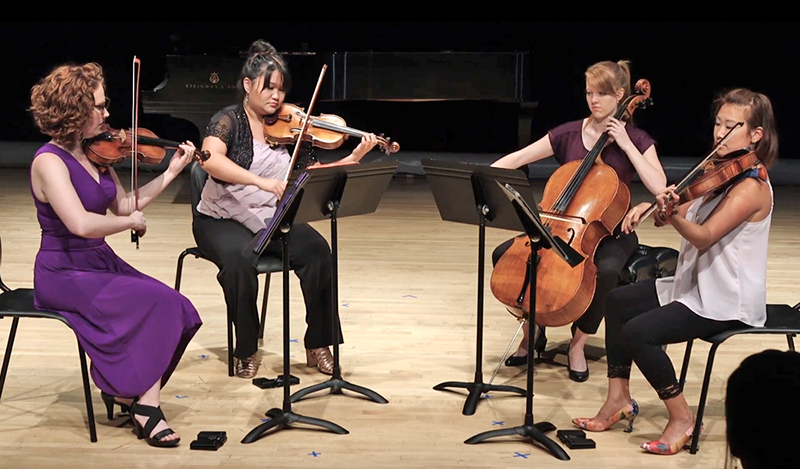 Snowden’s music possesses a naturalist’s feel, and with that, Semiosis created sonic folkish wonderment.The astonishing Semiosis players are Nicole Parks and Kyra Davies, violins; Lauren Nelson, viola, and Allison Drenkow, cello. Hello, thanks for the review. Being the person who dealt directly with the violent interruption of the concert, I just wanted to clarify what actually happened. Although I had a piece on the concert, I was also running the door which included handing people programs and taking donations. As is often the case with concerts, a few folks were trickling in after the concert had started, and my job also included making sure they got programs and that the door was closed quietly as to not interrupt the performance. During the second piece, the door opened and I began to stand up in order to quietly invite them in, hand them a program, and point to some empty seats. However, before I finished standing up, the man started violently yelling “Motherf***kers” and other profanities while turning around as if he were walking away. This was very alarming and I certainly had no clue as to what his issue was, but I knew that I wanted to prevent further disruption and keep everyone safe, so I went to close the door. As I was closing the door (he was still cussing), he grabbed the door and started vigorously pulling on it, which somehow swiped my finger causing it to bleed (something I didn’t notice until a few minutes later). I got the door closed (the music had stopped at this point because of the scary interruption), and he proceeded to go to the parking lot and loudly scream profanities at us from outside of the window for a few minutes. As if that weren’t violent and ridiculous enough, he then got in his car and sat in the parking lot for a few more minutes blaring his car horn to further disrupt. He then started driving away while blaring the horn and yelling. There is a playground and basketball court right by where he was yelling, and an audience member asked the kids on the court if they had heard the man, and they said they called the police. We did decide to file a police report after the concert. So to be clear, I was standing to greet him into the concert, not deny him entry, and he started cussing and yelling, which led me to close the door.